Carrot soup is a crowd favorite. I wanted to give the traditional soup a fun spin. The pistachio provides a deep nuttiness that pairs perfectly with the sweetness of the carrot. Tarragon is one of my favorite herbs and I’ll sneak it into dishes for its wonderful bright flavor. 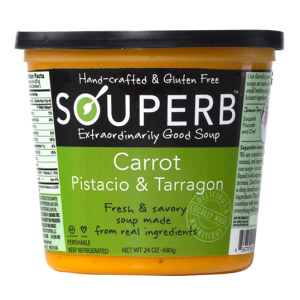 The marriage of carrot, pistachio and tarragon in this soup is something you will want to enjoy spoonful after spoonful. I cooked for a division of Google and they loved my Indian cooking so much that they requested it every week. Included in the meal was curry cauliflower dish, which is the inspiration behind this soup. 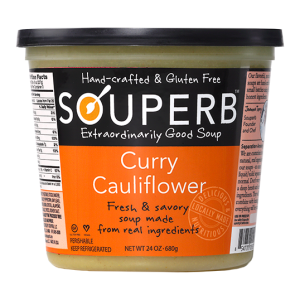 The curry flavor is not hot (but can be heated up with the addition of hot chili) and beautifully compliments the creamy cauliflower texture of this savory soup. Each spoonful is satisfying and warms my heart as I hope it will yours. I love Broccoli. I wanted to create a broccoli soup that would include all of the health benefits and flavor of broccoli and not be cheesy or bland, which I have found in most broccoli soups available. 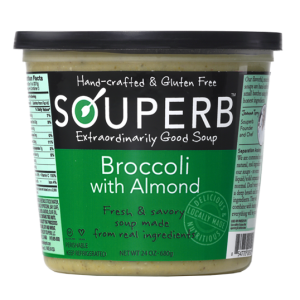 I love topping my roasted broccoli with slivered almonds, so I created a soup featuring a nourishing blend of broccoli and the hearty taste of almonds. I love ending a busy day with a warm bowl of this broccoli soup. It’s truly one of a kind. I tried your broccoli with almond soup for the first time. I took a break to have lunch after a hard morning and this is the BEST soup I've ever had! post your questions or pictures on our facebook page. We use a sealed film between the lid and the contents of the container for tamper resistance. The film is sealed very tightly to help maintain the quality of your soup. Films with tabs that are easily pulled back do not have a tight seal. Remove the lid. Pierce the seal with a knife or fork to remove. Do this carefully, so soup doesn’t splatter on you. 1) Heat inside the container in a microwave. Containers are microwave safe. If you do this, remove the lid and pierce the film seal a few times. Heat for three minutes, mix and heat for another two minutes until hot (165 degree on thermometer as timing depends on the wattage of your microwave). Carefully remove from microwave. 2) Empty contents into a microwave safe bowl. Cover and heat until 165 degrees. 3) Empty contents into stovetop saucepan and heat. Stir. Enjoy! Are your soups gluten free, soy free and free of corn products? Absolutely! We are proud of our quality ingredient list. Check it out. Can I freeze your soups? Yes. They don’t have any added cream or milk (besides the little bit of butter in the butternut squash), so they freeze great. Are your soups low sodium? Yes, compared to other soups. We worked hard to develop soup recipes that use quality ingredients to enhance flavor instead of just adding more salt. If you tend to enjoy saltier foods, you may want to add some salt. Which soups can I eat cold? Our fans love the carrot pistachio soup cold. They also enjoy the curry cauliflower either hot or cold. The pea soup is often enjoyed cold. The black bean soup makes a great dip served cold. You will notice that the flavors change slightly when served hot or cold, so try them both to taste the difference. The consistency will also change. Cold soups are much thicker, so you can use as a cold sauce (mix with your favorite pasta for a pasta salad or other grain). What do you recommend adding to your soups? They are great on their own, but you may get as creative as you like. Quinoa is a great addition to the four vegetable based flavors. Lentils are great added too, especially in the curry cauliflower soup. The carrot soup is a delicious base for white fish. Cook down (to evaporate some of the liquid) until a sauce constancy. You can also use it in your bolognaise. Sauté some grass-fed ground beef with onions, season, add the carrot soup and reduce down until desired constancy. Yum. You can also use the soups as a pasta sauce. The broccoli soup is a favorite. It’s a healthy great alternative. Have fun. Let us know what you enjoy. When will you be at a store near me? We are working on expansions. Let your local store know you want them to carry Souperb soups. We are usually found in the Prepared Foods/Deli department. Sign up for our mailing list and we provide periodic updates when we enter new markets. Will you have more flavors of soups? While at Farmers’ Markets we sold many varieties of soups. We launched with the four most popular. We will be introducing more exciting flavors to grocery stores as soon as possible. Our fans let us know which ones they miss the most, so these will be the first to come.